The Stampex Post and Go machines were not without their problems, it seems. US collectors would categorise these as 'Errors Freaks or Oddities'. Thanks to Greg for these and other similar pictures. This one on the other hand is a clear variety. 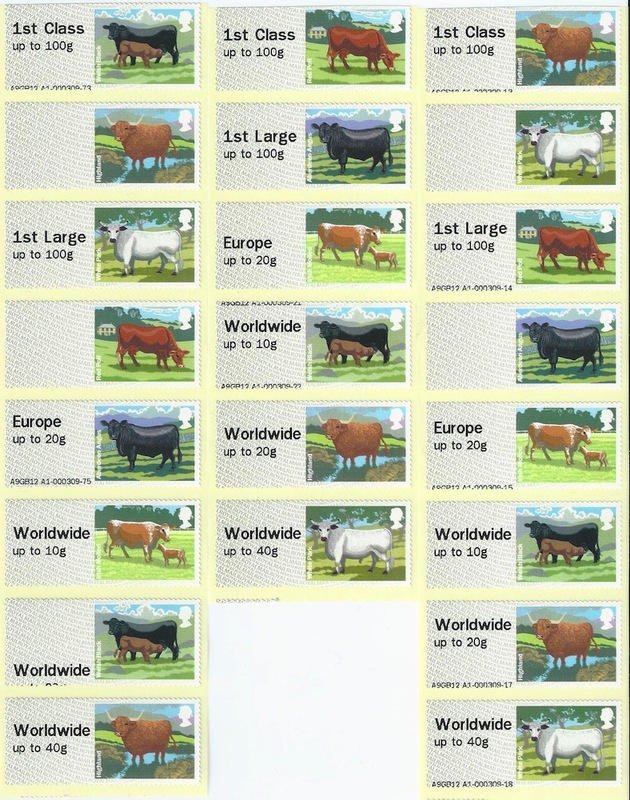 Caused by an error in loading a roll into a back-office machine, the Cattle have the Diamond Jubilee overprint. This one was spotted on eBay. I can confirm that the cattle misprints are genuine errors which took place at public machine A1. I was there and watched it happen and managed to video it. Handful of collectors were lucky enough to get hold of them. Unfortunately I was not one of them as the error got rectified by the time I could get to the machine. Good luck to those who got them. I was lucky enough to get some of these strips and can confirm that the machine did in fact have a fault and that these are genuine errors. Was this on the Friday morning ? I was in the queue for both machines and a man who had already purchased his stamps contacted one of the RM staff to say he had a problem with the stamps he had obtained. The RM guy took them off him, passed some comment, went round the back and came back with the "proper" set and gave them to the man. They then looked at A1 (the left hand of the 2, messed about with it and it was unfortunately working okay at 10.40 when I got to it. If he had bought a sheet from the counter and it had no value, missing Queens head and missing colour, would he have handed that back as well ? Anonymous asks 'was this on Friday morning'? It may well have happened on Friday morning but the strips that I got from the machine were on Friday afternoon and my receipts are timed at approximately 14.15 to 14.22. "If he had bought a sheet from the counter and it had no value, missing Queens head and missing colour, would he have handed that back as well ?" Ha! No accounting for some people is there. Some of us have the imagination to see a good thing, and others see only something broken! I see the Cattle Post & Go strip with the Diamond Jubilee overprint has sold for £316.00. I wonder how many more will now come out? Camberley has had an engineers visit and is now standard font 2. Went wrong on 2nd October. P&G stamp roll problems, Post it now couldn’t read the weight on the scales & card payment issues. On the plus side it now accepts the revised metal content coinage. Ian, apologies if this is answered elsewhere, or is extremely obvious, but as a non-stamp & go collector I didn't immediately understand why the large font errors meant "and of course no 10g denomination". Was that simply not printed as part of the large font originally? Or is too big in large font and isn't printed as a result? On version 1 of the Post and Go software the Worldwide 10g stamp could only be obtained from the 'post a letter' menu, rather than the 'buy a stamp'. As you can imagine this made obtaining a strip of 5 (in order) complex, and it took some people a while to even find the 10g stamp! I don't know the ins and outs of the software but since version 2 introduced the Worldwide 40g and the Collectors Set, if on any occasion the machine is reset and the font reverts to that used in v1, the 10g weight doesn't get printed - presumably because it was never included in the v1 'buy a stamp' options. Machine A1 malfuctioned on at least several occasions to my knowledge throughout Friday, leading to the misprinted Cattle strips. No surpise Camberley & Gloucester are fixed the ebay listings gave away where to send the engineers. Still with only 2 offices with the errors and both fixed quickly i think it will be a nice way to finish font errors. 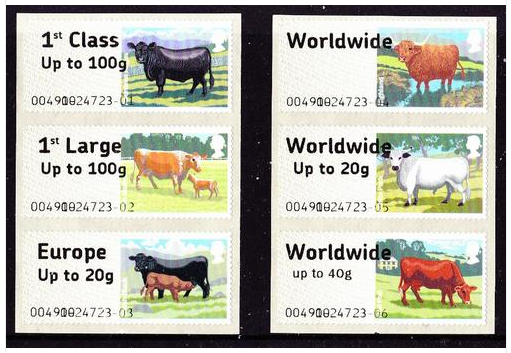 Still not sure why the face value of the no weight stamps have not caught on they are valid up to 1999 grams outside Europe. I have used them many times and never been surcharged. A YouTube video of the production of these long strips is now included in this report.